1. 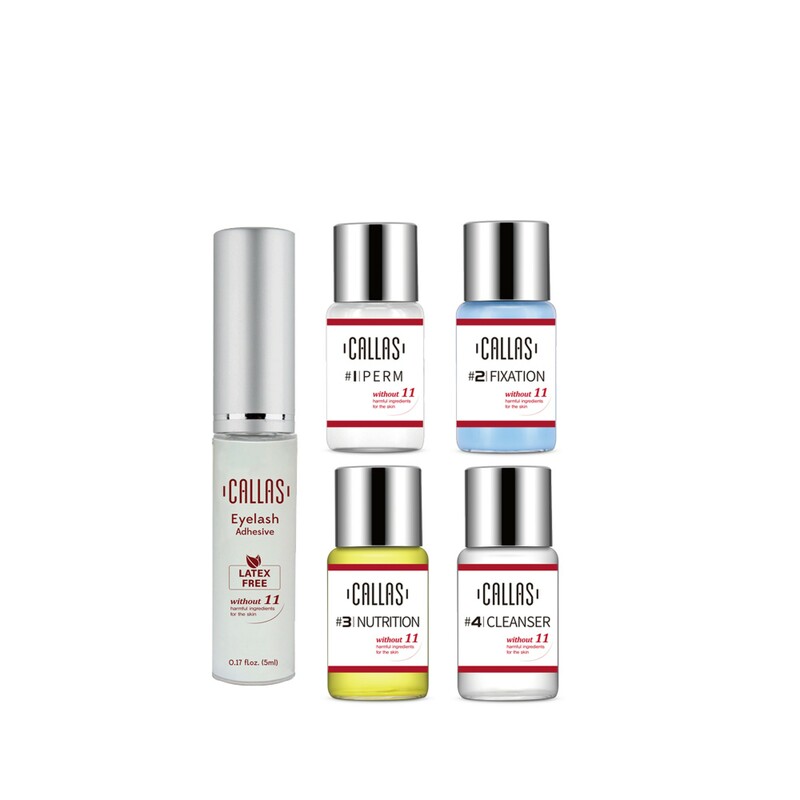 Clean off oil, dirt, and residue from eyes. 2. Place on the lower lashes, under the eyelash mask. 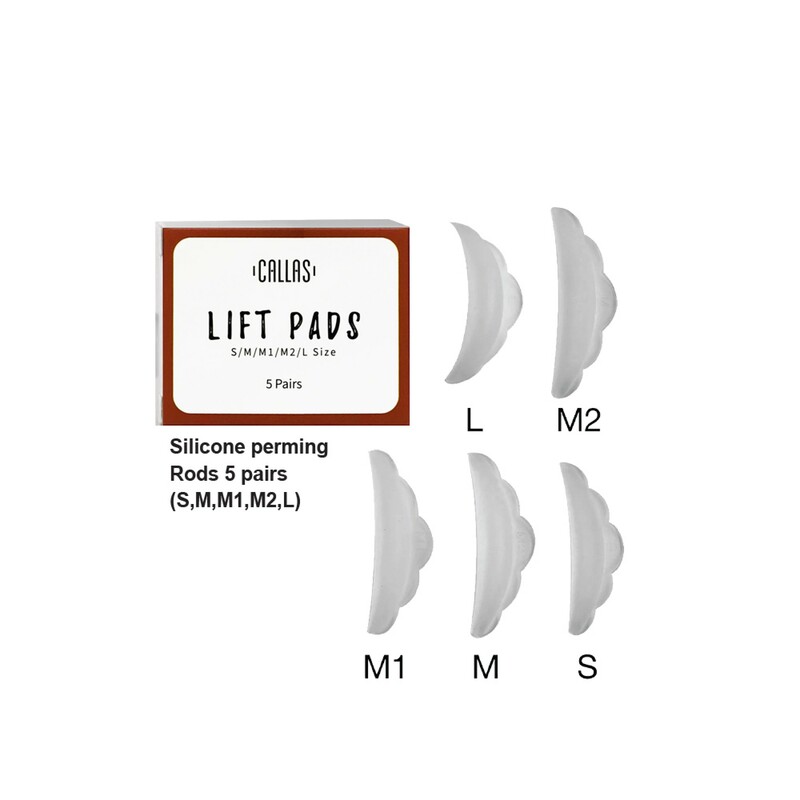 Apply the lift pads in small or large depending on the amount of the desired curl and the natural length of lashes. Apply the Callas Eyelash Adhesives on the eyelash to keep it secure on the eye mask. If you do not get close here, you will not get a nice curl. 3. Apply the #1 Perm on the lashes for 8-15mins. Apply with a Y-shape Brush, Q-tips or swabs, carefully coating each lash. For thicker hair, you will leave this on for 15mins. Remove all of the perms with Q-tips or micro swabs. Do not use water. Carefully make sure all of the perming is removed. Do not reuse Q-tips or swabs. 4. Apply #2 Fixation for the same amount of time as the perming. Make sure to evenly coat all of the lashes with Q-tips or micro swabs. Carefully remove all of the Fixation, leaving lashes glued in place on lift pads. 5. Apply #3 Nutrition lashes and leave the lashes with the oil on them. 6. Remove adhesive and lift pads with #4 Cleanser. Use a Q-tip for this and gently remove all glue residues. Clean the eye area. • If signs of irritation or rash appear, do not use. • Keep away from direct sunlight. • If eyelashes are weak or brittle, do not use. Wash eyes with water or saline solution if it accidentally goes into the eyes. • If an allergic reaction occurs, consult a physician. 1. The lift lasts 8weeks and can use 20 times. 2. Use within 6months after opening. 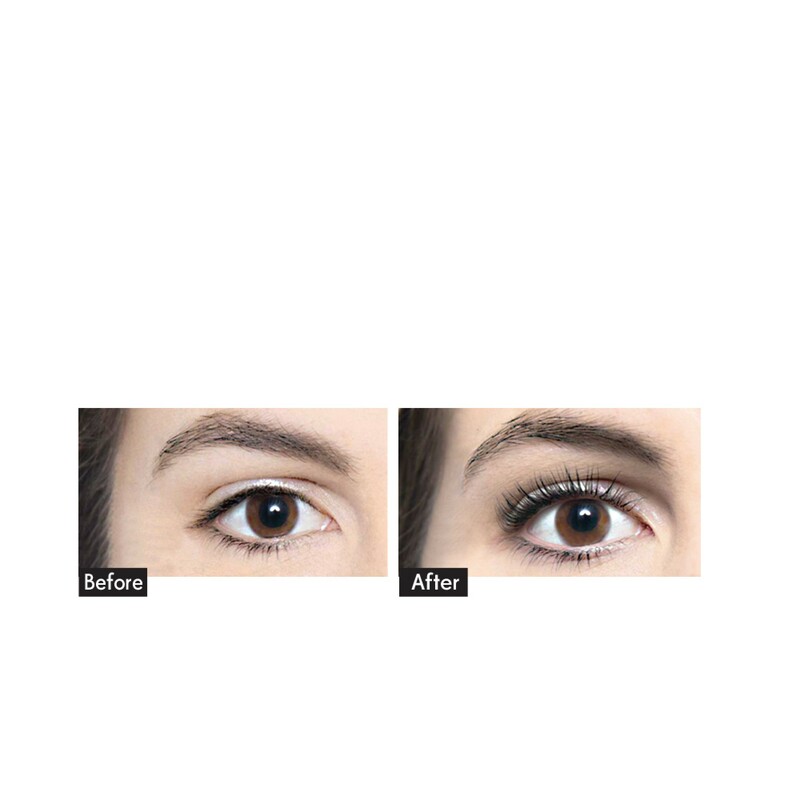 the natural lash, resulting in longer, lifted, defined and healthier lashes. 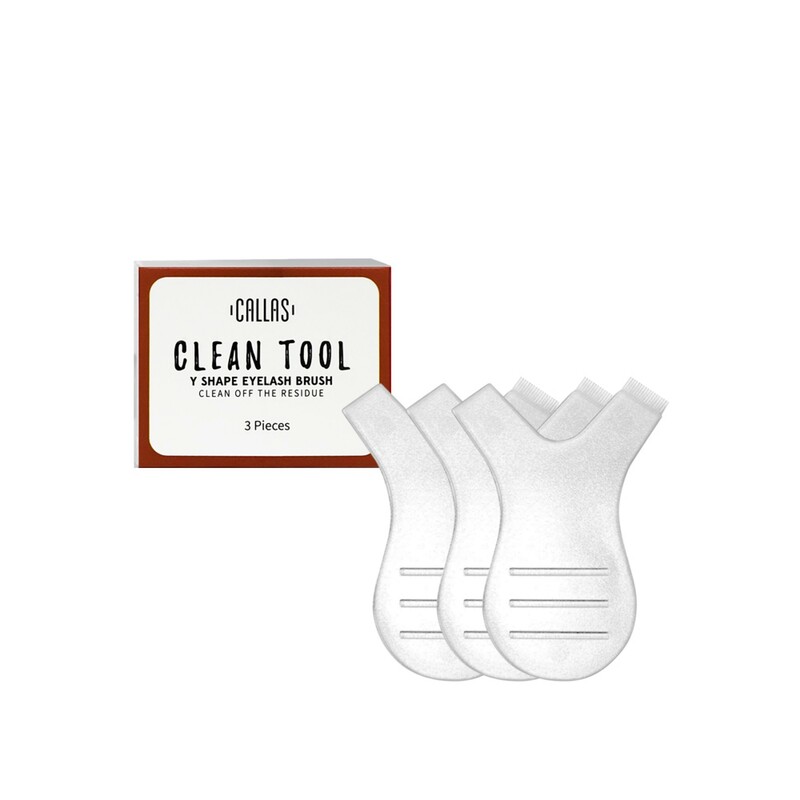 Callas Eyelash Curler with additional two refill pads. DescriptionIncludes 2 replacement rubber pads. Ultimate precision that delivers the perfect curl. C..
DescriptionIt is designed to make applying Callas Eyelashes easy and precise and to fit comfortably ..
AdvantagesFormulated without 11 harmful ingredients.Latex Free, Gluten Free, Sulfate Free, Paraben F..
ST-10 Straight (FineTip) Precision Vetus Stainless Tweezers• Anti Magnetic Hard..
ST-12 Straight (Medium Tip) Precision Vetus Stainless Tweezers• Anti Magnetic H..
ST-14 (Super Fine Tip) Precision Vetus Stainless Tweezersl• Anti Magnetic Hardness 40..
ST-15 (Fine Curved Tip) Precision Vetus Stainless Tweezers• Anti Magnetic Hardness 40..
Callas Lift Pads / Silicone Eyelash Perming Curler Shield Pads - 5 Pair (10Pcs)Qty: 5 Pair (10Pcs)∙ ..
CALLAS Clean Tool Y Shape Eyelash Brush 10pcsHigh-quality silicone materialNon-toxic / Fish shape / ..